As the representative medium capacity of sand plant, SAMYOUNG prepare for 150T/H Sand Making Plant, consists of Jaw crusher, Cone crusher, Vibrating Screen, Hopper, Vibrating Feeder and belt conveyors mainly but Horizontal Impact crusher can be replaced or added by Cone crusher according to customer’s requirement. It needs almost same equipments but should have Spiral Classifier and Sand unit (sand maker) sometimes. 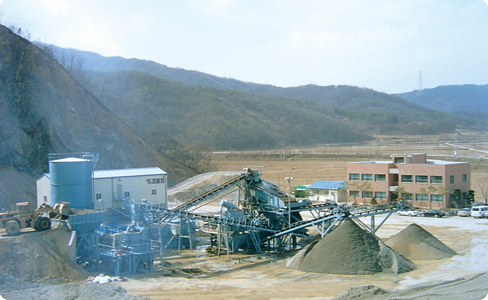 150t/h sand plant usually use for making sand from limestone, granite, basalt to product. It can product several sizes of aggregate together.